Telescopic ladders work just like a collapsing telescope and are easy to store in places where a conventional ladder might not have normally been stored due to space limitations. Easy Rack?s telescopic ladders meet OSHA and ANSI standards are small enough to transport inside trucks, cars and vans to minimize thefts. All of our telescopic ladders extend in 12? step increments and come with a extra wide base that offers more stability. Ladder steps are serrated for better traction and have conical feet for maximum slip resistance. Our telescopic ladders are constructed from lightweight aluminum which make them easy to carry and will not rust. Each ladder step is serrated and has a spring loaded locking pin that automatically engages to secure ladder step height. The release mechanism provides a smooth automatic closing action. 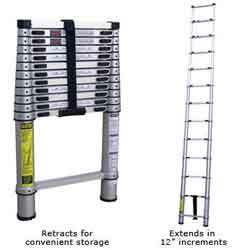 Telescopic ladders extend in 12 inch increments. Ladder top bumper guards and molded rubber feet protect walls and floors against dings and scratches. Telescopic ladder systems do not have to be fully extended in order to work safely because each ladder rung locks into place once extended. Experts agree that telescopic ladders are best suited for light to medium work. Easy Rack offers a variety of industrial-commercial ladders including Steel Rolling Warehouse Ladders, Cross-Over Ladders, Commercial Ladders, Commercial Spring Loaded Ladders, Industrial Ladders, Convertible Hand Truck/Step Ladder, Fold-Up Step Ladders and Foot Stools. Choosing the right ladder for the right project not only saves on time, but also may save lives. Call Easy Rack today at 1-888-776-3720 and we will answer your questions and help you find the right industrial ladders for your needs.